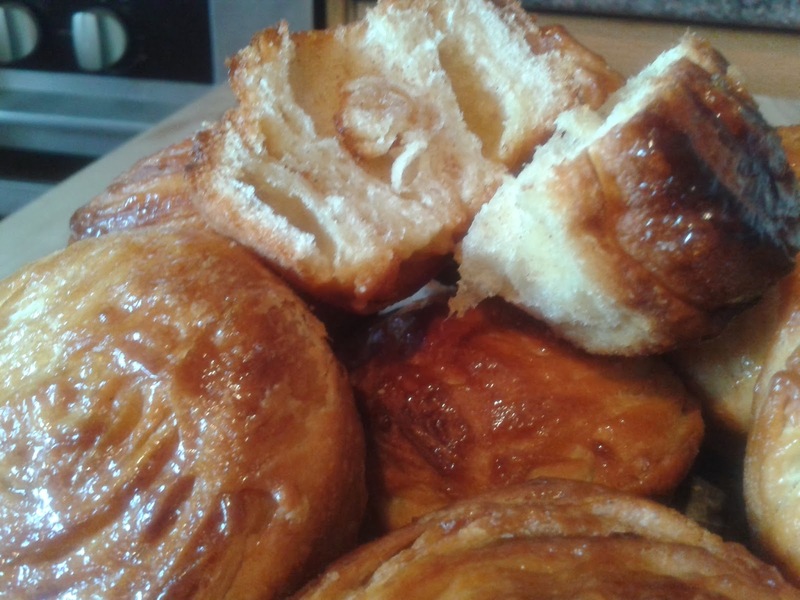 Having discovered on a recent holiday to Brittany, the delicious sweet & buttery Kougin Amman (Breton Butter Cake). I decided there and then to make these Bretagne delicacies. So on my return armed with a boot full of T45 & T55 flours, beautiful Bretagne butter (and of course wine) I set about researching for recipes. 1. Place your flour, yeast and salt in a bowl, give it a whisk up to distribute everything. 2. Rub the melted butter in, add the water, bring to a soft dough, cover and leave to sit for 10 minutes. 4. Roll the dough into a rectangle and spread over two thirds of it half the butter, sugar & spice. 5. Fold as per puff pastry and give half a turn. Its going to be sticky!! 6. Repeat steps 4&5 using the other half of the butter, sugar & spice. 7. Leave the dough to rest for 10 minutes and roll out again to give another half turn, repeat once more. Eat warm with a French blend coffee or even an English tea. Variations can include filling with nutella, or even a lemon curd.. love to hear your feedback.